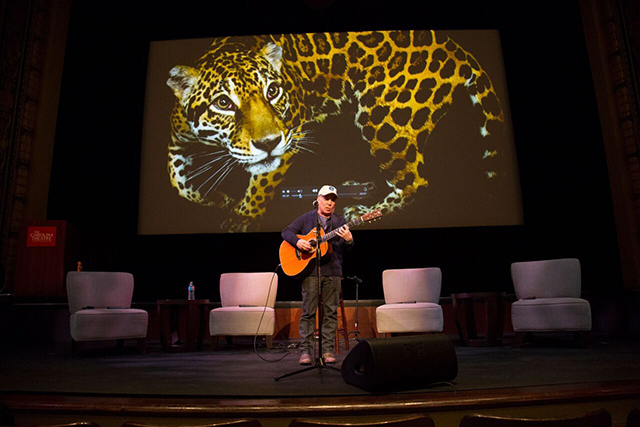 • Twelve-time Grammy winner Paul Simon spoke to Mongabay during the E.O. Wilson Foundation’s recent conference in Durham, North Carolina. • Proceeds from the tour will support the Half-Earth Project, an initiative of the E.O. Wilson Biodiversity Foundation. • He spoke to Mongabay about optimism, life on Earth, and more during an hour-long conversation. • It was widely reported that the iconic singer-songwriter was considering retirement, before this announcement. 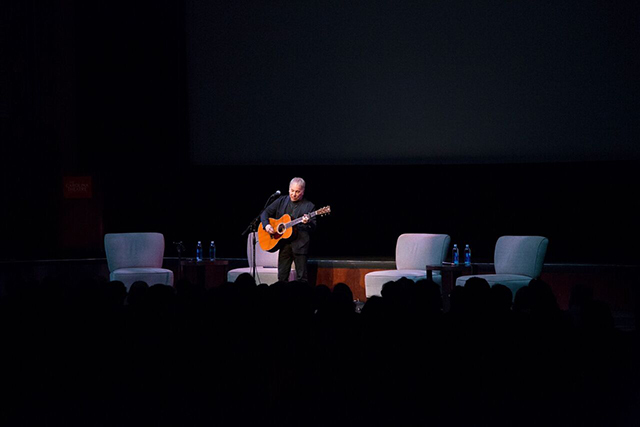 Paul Simon performs during Biodiversity Days. Photo by Chris Sims, E.O. Wilson Biodiversity Foundation. DURHAM, North Carolina – Listening to Paul Simon talk is a little like listening to him sing. His voice is melodic and soothing; his words are thoughtful and evocative, capable of penetrating both heart and bones. A lyric comes to mind, and it enlarges to represent the motivation that brought Simon south from New York City to Environment Hall on the campus of Duke University in early March. Simon was here to be of service to a friend. That friend – E.O. Wilson – is a legend of conservation with an audacious idea at a perilous time that has come late in life. Simon, sensing his own mortality, is eager to match Wilson’s unflagging energy and enthusiasm in the way he knows best. With his voice. Multi-Grammy winner Paul Simon joins renowned biologist E.O. Wilson on stage in Durham. Photo by Chris Sims, E.O. Wilson Biodiversity Foundation. The iconic master of the American songbook for more than a half century, winner of a dozen Grammys and the author of such enduring classics as “Sound of Silence” and “Bridge Over Troubled Water” participated in Biodiversity Days, a two-day conference here sponsored by the E.O. Wilson Biodiversity Foundation. The conference aimed to promote the grand, central idea of Wilson’s recent book, Half-Earth – setting aside half of the Earth’s lands and seas to enable nature to recover from humanity’s global impact and vastly reduce the current rate of species extinctions. Not surprisingly, given a career of subtle musical activism (“Graceland”) and unheralded philanthropy (Children’s Health Fund), Simon agreed to Wilson’s request last fall to “do something” to help propel a potential Half-Earth movement. Wilson was supposed to announce Simon’s contribution to the cause to a sold-out audience at the Carolina Theater in downtown Durham on the evening of March 2. But in introducing his friend for a five-song set following an intense panel discussion on Half-Earth, Wilson simply forgot. Simon chose instead to break the news in his exclusive interview with Mongabay. This June, he and his band will embark on a 18-city U.S. concert tour that Simon believes will generate “millions of dollars” for the E.O. Wilson Biodiversity Foundation and raise awareness for the Half-Earth cause and its leader. Funds could possibly be used to promote the protection of lands in and around Wilson’s native south Alabama where intact ecosystems still thrive in the wetlands and pinelands. Simon has a calm, soulful presence and the insatiable curiosity of a world-traveled artist. He wears beaded bracelets and necklaces given to him by spiritual healers in Brazil and Norway. And he remains determined to find meaning and relevance in his music – “I’d rather play a TED conference than Las Vegas” — even as he contemplates hanging up his Martin guitar and leaving center stage for good. In an hour-long interview, Simon made clear that his friendship with Wilson and the fate of the planet have ignited a renewed passion to continue doing what he’s done better than most of his musical peers since the 1960s. And it all starts with the songs. Justin Catanoso for Mongabay: You chose a set of old, classic songs for your performance at the Carolina Theater – “America”, “Me and Julio Down by the Schoolyard”, “Homeward Bound”, “The Boxer”, “Sound of Silence.” Given the biodiversity theme of Dr. Wilson’s conference, was there a reason for those particular songs? Paul Simon: You know, it’s mostly those are the songs I can easily play on guitar by myself. I don’t need a band. As my career evolved, the guitar parts became more complex. I couldn’t play the complex parts and sing at the same time. That’s when I started to change the way I recorded. Eventually, I said, I don’t have to play the guitar parts either. I can give them out to guitar players who are great…and move immediately into editing mode. And that’s what “Graceland” was. Mongabay: I remember hearing “Graceland” for the first time when it came out in 1986. It felt historic, like nothing I had ever heard before. And it was risky for you, working with South African musicians during apartheid while Nelson Mandela was still in jail. Artists were told to stay away. Paul Simon: A bunch of people made up a rule and said, “You artists can’t do this.” But they didn’t ask any of the artists, and the artists didn’t agree. In fact, their thinking wasn’t very clear. There was no reason in the world why I should not be able to go and record with African musicians who wanted to record with me. Don’t perform there, I understood. I was not going to perform in front of a segregated audience. Or an audience that didn’t allow blacks. But to record and to pay everybody fairly, and take them out on the road, and bring the music out to the world — that’s what they wanted. So did I, musically. Politically, it showed the world a very loving face of South African people. It wasn’t just good guys and bad guys. It was Ladysmith Black Mambazo. Paul Simon’s “Graceland” tour. Photo by Luise Gubb. Mongabay: There was incredible awareness-raising around “Graceland.” Now you have this opportunity with E.O. Wilson and Half-Earth. I understand you first met at a TED conference in 2007. Paul Simon: I was performing. And they gave three prizes. Ed received one of the prizes, and part of the prize is people of TED ask the audience to help bring about the wishes of the prize winner. In Ed’s case, he wanted to compile an encyclopedia of every known living organism. He asked for people in the audience to help in any way they could. When he spoke, he was talking about what he wanted to achieve with the encyclopedia and why it was doable. And he talked about myrmecology, which is the study of ants, which is his field, and then he made this statement: that by the 22nd-century, Earth could be a paradise. It was so inspiring to think about it. And I did think about it. Earth’s a jewel, but it’s endangered. And he said that, he said we could lose it. But we have the ability to fix it. It’s going to take a little while, maybe 100 years, maybe 200 years, to fix it. But we can, and then it would be like living in paradise. But he said it’s only going to take 75 to 100 years to make it into a desolate place. Mongabay: Had you given much thought to such issues before? Paul Simon: I was aware of the environmental threats. But I didn’t think of them as an extinction possibility. I thought, we’re not going to be able to breathe the air. The water isn’t going to be drinkable. All of those things are going to happen. But I didn’t think that species are going to go extinct, and that as species go extinct, their function in the ecosystem is compromised. And as the ecosystem is compromised, it will compromise the adjacent ecosystems and so on in a domino effect that will produce this horrific conclusion to this phase of life on Earth. And we’ll have to wait another 10 million years for the oceans to recapitulate the life cycle. Mongabay: But hope through strategic, sustained action is a big part of Wilson’s message, especially in Half-Earth. Overall, what was it about his message that resonated with you? Paul Simon: I think the optimism, the hope, especially when you have reason to believe there’s cause to be optimistic. It is more inspiring in this particular way than fear. It’s not always the case in human nature, but in this particular case, predictions of dire consequences for our actions tend to produce denial. We block it out. That’s one of the main things you have to fight. There are so many people who believe it isn’t happening. Or that it’s a hoax by China. Mongabay: Not long after you met Dr. Wilson, he invited you and your family to visit his lab at Harvard. Why did you want to go see him, to build this relationship? Paul Simon: He is so interesting. He is so charismatic. And he is so humble. I was thrilled that he knew who I was! I was so surprised that he invited us. (At the lab), there were all these drawers, and just thousands and thousands of ants, each one pinned to a little card, each one with a hand-written card and Latin name for the (species). And he can go on and on about the different species, the characteristics of them, and that they are the only other species besides humans that are communal. They work as a society. There is an analogy that he pointed out. It was very interesting. Mongabay: So you had this powerful meeting and connection with Dr. Wilson a decade ago, yet years passed before you would reconnect. Paul Simon: Yes, but things can have a lasting impression. They correspond with something that is innately yours and deep. It’s the same with music. Music that I heard at a certain age that I love, I still love. It doesn’t mean I don’t love other music afterwards. I do. But I never forget the source. And it comes back with the same emotional power. So here’s this world figure who understands what’s going on (with the planet) and can explain it in a way that I understand. And he is making me feel like something can be done. Not that I went and did anything in particular, other than write checks. Mongabay: Did the environmental issues raised by Dr. Wilson inspire you to write any particular songs? Paul Simon: I don’t think so much about writing about climate change, for example, but “Boy in the Bubble” (from “Graceland”) talks about the growing desert in Africa. I bet I can find 10 songs that say something about it. I don’t write songs about political issues, but it slips by in this verse or that verse. Because it’s a part of your continuous internal dialogue. Mongabay: Sometime last year, Paula Ehrlich, who heads of the E.O. Wilson Biodiversity Foundation, heard a radio interview with you talking about the lasting impression Dr. Wilson made on you. She let you know that Dr. Wilson wanted to see you again. Paul Simon: I was thrilled. He came down to New York and we sat and talked and he gave me a copy of (Half-Earth). It was great! He drew a little ant and had the ant say, “Thank you.” So it’s a treasure. And I heard what he was doing and he said he wanted my help. And I said, I don’t know what I can do. I said, I can sing. I can sing at a concert. I can bring some people together. I mean, the problem is immense. What can I do? So basically, Ed said, “You can help us bring people’s attention to this issue. But read the book.” And the book was galvanizing. Paul Simon: First he explains how life emerges. Then he explains the hierarchy of the ecosystems and how they support biodiversity. And why biodiversity is essential for life to continue. And why the threat to biodiversity is such a powerful threat. Because if a species becomes extinct, it’s gone. He said, we’re not going to recreate a woolly mammoth just because we can get a bone and some DNA. It’s not going to happen. Once it’s gone it’s gone. And when enough of the biodiversity dies out, the ecosystem dies. And the ecosystems are large, they’re huge like rain forests, but so are our internal organs. And that puts me back into a big picture which introduces the subject of God to the conversation. God and the mystery of everything, which I am very drawn to, even though I don’t follow any religion. This started to focus my thinking. The metaphor of the ecosystem wasn’t something I thought about before because I really wasn’t familiar with the term ecosystem. But the book really ignited my imagination. I started to think: what can I do? We spoke again, and I made a couple of connections to other people, and then I thought, I need to step back and see what I can do. Mongabay: This came at a time last year when it seemed like you were considering retirement from music. Paul Simon: I actually said, I’m thinking about stopping performing. What would the consequences be? I didn’t mean I intend to. I am beginning to think about the consequences of changing my impulses from always resolving things in a piece of music to producing something else that I don’t know about. I’m not saying I would even do it, but I was thinking about it. I didn’t have any nervousness. There was no anxiety. But I said, if I do a tour, I can keep singing, I can keep my skills up. I can keep my band together. And I can give all the profits to Ed. And that will make me feel that I am making a greater contribution than putting more money in my pocket, which I don’t need, or becoming more famous, which I really don’t need. So I said (late last fall), ok, I’m going to do that. Mongabay: So what’s happening in June? Paul Simon: I’m going to play 17 shows. And whatever the net is after expenses, I’m going to give that money to Ed’s foundation. We’ve been talking about what he might want to use that money for… Ed said the Southeast of the United States is the most biodiverse area of the whole country. He explained that when the last ice age receded, two glaciers separated and fauna from either side came in to this area and filled it up, and it became extremely rich in biodiversity. It’s also one of the areas of the country that’s the most vulnerable and the least protected. So he was saying it would be tremendous if we could protect a large swath of area through Alabama down through the Gulf Coast, including Florida. That would be a great achievement. We can explain that to people — say this part is vulnerable and we need to save it. Mongabay: Are you going to call this the Half-Earth concert tour? Paul Simon: I haven’t decided yet. I don’t know if I’ll put a banner up. It’s a concert of music. It’s not a lecture. I don’t want people to come and think they’re going to be lectured to. But I don’t mind having Ed’s book available or having (Half-Earth) caps there. Mongabay: Will Dr. Wilson appear at the shows? Mongabay: I want to change the subject for a moment, but not away from philanthropy and activism. Before Dr. Wilson there was Dr. Irwin Redlener, a pediatrician in New York City. Not many people know about this long-term commitment of yours. 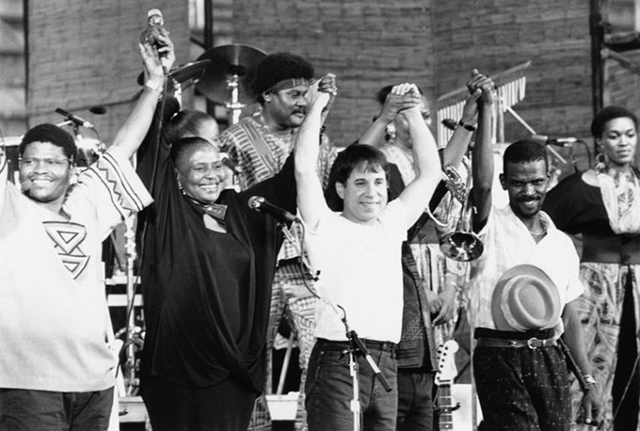 Paul Simon: That was 30 years ago and that’s the Children’s Health Fund (which Simon co-founded with Redlener after touring homeless shelters in New York City in 1987). It provides mobile medical units to poor communities for pediatric care. It’s like a big Winnebago. They have a doctor, a nurse, a driver and a computer person. The units are always linked up to a local hospital (in around 15 states)…We’re very effective in emergencies. We were down in Biloxi three days after Hurricane Katrina. Over these 30 years, we’ve had millions of doctor-patient visits (with children)…Really, the credit goes to Irwin and his wife, Karen. I have just been the public face who does the fund raising. Mongabay: With both the Children’s Health Fund and Half-Earth, you seem drawn to the hope and optimism of enormous social and global problems. Paul Simon: Well, yes. The other way, it’s paralyzing. But yeah, you feel better. And you can do something. I would really like to help work on the environment. I would just as soon not work on some political battle for the next four years where you’re angry and exhausted all the time. There are other people who are going to do that. This is what I think is a priority. If we don’t have a planet, then all human rights issues are moot. 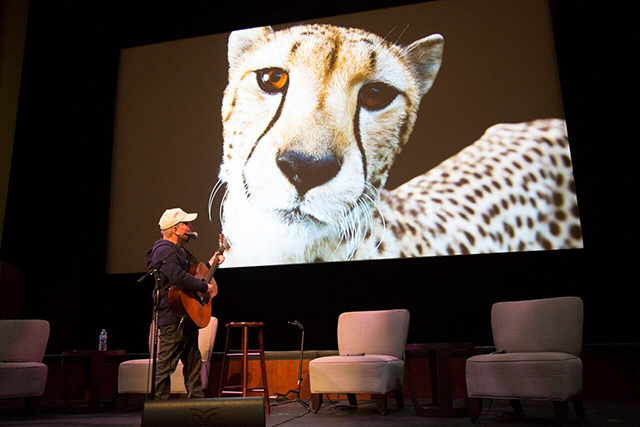 Mongabay: So in June, you and your band will perform in 17 cities in support of Dr. Wilson’s ambitious idea. What do you hope concert-goers take home with them? Paul Simon: The Half-Earth thinking and the name of Edward Wilson will be more familiar at the very least because of this, and that will accomplish who knows what. Hopefully something significant. It can’t be insignificant. It will be something. It makes sense to me. It gives me added incentive to go out and perform again…I mean, look at Ed. At 87, he’s remarkable. And we’re so fortunate that he’s doing this. The song lyric comes again to mind: Paul Simon knows what he knows. He will sing, and with his songs, he will do what he can to help the planet. He recognizes the urgency of the moment. That’s a thing that E.O. Wilson put in the back of his head. Justin Catanoso, a regular contributor to Mongabay, is a professor of journalism at Wake Forest University in North Carolina. Find him on Twitter, @jcatanoso. 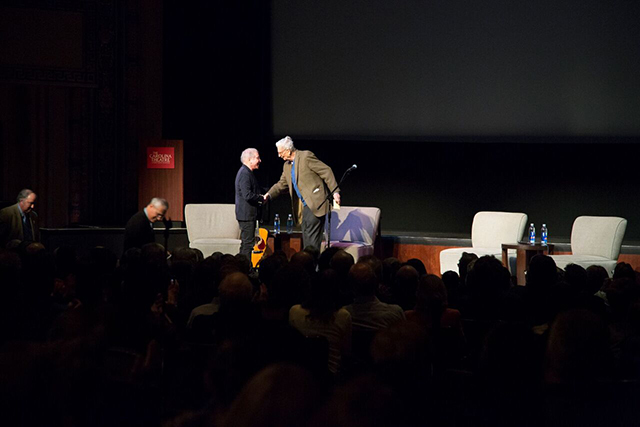 His conversation with Paul Simon will appear on the next episode of the Mongabay Newscast, Mongabay’s biweekly podcast. Read a recent interview with E.O. Wilson about Half-Earth conducted by Mongabay senior correspondent Jeremy Hance here. Mongabay is a nonprofit conservation news service publishing in nine languages for a global readership since 1999, learn more here. The interview with Paul Simon starts at the 6:02 mark. “Paul Simon Plans Summer Tour to Support Biodiversity Initiative.” Rolling Stone. March 14, 2017. “Paul Simon’s Summer Tour to Benefit E.O. Wilson’s Biodiversity Project.” The Huffington Post. March 13, 2017. “Paul Simon Plots Summer Tour to Support E.O. Wilson’s Biodiversity Project.” billboard. March 14, 2017. “Singer Paul Simon to Promote Biodiversity with New Tour.” Daily Mail. March 14, 2017. “Folk Rock Singer Paul Simon to Promote Biodiversity with New Tour.” GMA News Online. March 15, 2017. “Paul Simon Announces a Concert Tour for Charity.” Uinterview. March 16, 2017. “Paul Simon New Tour Could Help Save the Planet.” WJBD Radio. March 14, 2017. “Paul Simon Plans Summer Tour to Support Biodiversity Initiative.” Celebrity Peak. March 14, 2017. “Paul Simon Plans Summer Tour to Support Biodiversity Initiative.” Politics Box. March 14, 2017. “Paul Simon’s Summer Tour to Benefit E.O. Wilson’s Biodiversity Project.” Grejeen News. March 13, 2017. “Paul Simon’s Summer Tour to Benefit E.O. Wilson’s Biodiversity Project.” Hydroponics Highway. March 13, 2017. “Paul Simon’s Summer Tour to Benefit E.O. Wilson’s Biodiversity Project.” tro9.com News. March 13, 2017. “Paul Simon’s Summer Time Tour to Profit E.O. Wilson’s Biodiversity Challenge.” Screenplays and Film Stories. March 13, 2017. “Paul Simon’s Summer Tour to Benefit E.O. Wilson’s Biodiversity Project.” Green Earth Report. March 13, 2017. “Paul Simon’s Summer Tour to Benefit E.O. Wilson’s Biodiversity Project.” Real Media. March 13, 2017. “Paul Simon’s Summer Tour to Benefit E.O. Wilson’s Biodiversity Project.” Business Media Guide. March 13, 2017. “Paul Simon’s Summer Tour to Benefit E.O. Wilson’s Biodiversity Project.” US-News.Net. March 13, 2017. “Paul Simon’s Summer Tour to Benefit E.O. Wilson’s Biodiversity Project.” AltoSky. March 13, 2017. “Paul Simon’s Summer Tour to Benefit E.O. Wilson’s Biodiversity Project.” Awesome Days. March 13, 2017. “Paul Simon Plans Summer Tour to Support Biodiversity Project.” Top Celebrity. March 14, 2017. “Paul Simon Plans Summer Tour to Support Biodiversity Project.” Syience. March 14, 2017. “Paul Simon Plans Summer Tour to Support Biodiversity Project.” King Gossip. March 14, 2017. “Paul Simon Plans Summer Tour to Support Biodiversity.” CSFS. March 14, 2017. I am so thrilled that awareness is rapidly growing. Bravo to Paul Simon for being a champion of Half-Earth, as are we ~ THE RAMA EXHIBITION. Send it out to the world!